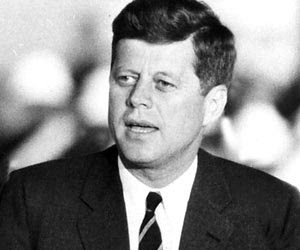 Kennedy, John Fitzgerald also know as John F. Kennedy was born on May 29, 1917 and died on November 22, 1963. He was the youngest person to be elected as American president, the 35th president of US from 1961-1963 (assassinated during his reign), the Roman Catholic president and the first president to be born in the 20th century. Below are some famous quotes quoted by John F. Kennedy during his lifetime. Enjoy! Democracy and defense are not substitutes for one another. Either alone will fail. The stories of past courage can define that ingredient-they can teach, they can offer hope, they can provide inspiration. But they cannot supply courage itself. For this each man must look into his own soul. We believe that if men have the talent to invent need machines that put men out of work, they have the talent to put those men back to work. We have come too far, we have sacrificed too much, to disdain the future now. John F. Kennedy, Amherst College, Oct 26, 1963 - Source JFK Library, Boston, Mass. This nation was founded by many men of many nations and backgrounds. It was founded on the principle that all men are created equal, and that the rights of every man are diminished when the rights of one man are threatened. I look foreword to an America which will not be afraid of grace and beauty.